In keeping with the rich local traditions of the region, Grand Velas Spa offers the Mayan Shawl Treatment: an ancient massage technique that utilizes blankets and shawls to achieve an important emotional connection, creating a rhythm in which relaxation and self healing activate the metabolism. The treatments works outward from the vertebral column to “adjust”, using shawls, movements and stretches from one side of the body to the other, thereby releasing tension and accumulated emotions; it results in relaxation and immediate relief. According to the wise Mayan culture, the treatment benefits the entire being- physically, chemically, emotionally and spiritually. It eliminates contractions, tensions, “knots” and sprains, as well as aligning the vertebra and correcting the posture. 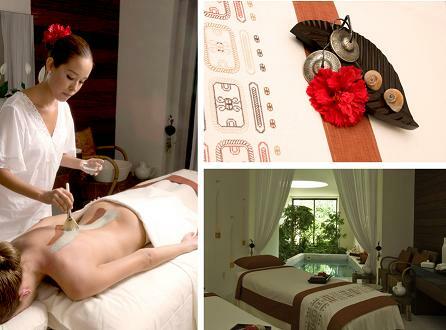 Enjoy Grand Velas Riviera Maya and its Spa (one of the best in the world), and this thousand-year-old practice. In 80 minutes the Mayan Shawl Treatment will guide you through a magical ancestral experience, full of relaxation and spiritual peace. The Mayan Yaxche Experience, a magical journey of almost one and a half hours. Beginning with a copal purification ritual, it is followed by a unique four-handed massage experience. Inspired by the ancient Mayan powers, you will experience healing choreography based on the power of the Jaguar and the wisdom of the Eagle.